In this article we will look into the Mule’s database connector. We will first see how to configure the datasource. Next, we will use the configured database to execute DDL. First in order to use mule database connector, we need to add mule-module-db to the pom.xml. If you are using mysql then the mysql driver is to be added to the pom.xml. In this example, we will be using mysql as the database. We will add db:mysql-config to our mule context and define the configuration parameters for the JDBC connection. <;db:oracle-config name="dbConfig" host="localhost" port="1521" instance="test" user="root"
Mule supports Mysql, oracle and derby out of the box. Any other database needs to be configured using the gereic configuration element <db:generic-config>. In the below example we will show how to retrieve the datasource. First retrieve the DbConfig component. Create database using spring JdbcTemplate. In our next example, we will see how to execute DDL query against a database using mule flow. We add <db:execute-ddl> and embed the DDL query within element <db:dynamic-query>. It refers to the database configuration using attribute config-ref. Payload sent to the inbound point is the database name, retrieved using expression #[payload]. 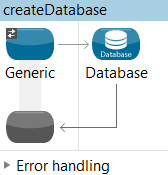 We pass the database name to the inbound endpoint vm://createDatabase which is then passed on to the next message processor <db:execute-ddl> in the flow that is responsible to execute the DDL. The DDL query is contained within the element <db:dynamic-query>. The database is retrieved from the payload using the expression #[payload]. This was an example about executing ddl using Mule.